Many golf bars in Pattaya have proved to be very generous where charity is concerned. Specific golf days are the main vehicle for collecting funds but Cafe Kronborg have different ideas. Their members are amongst the most generous and when Mike Gosden agreed to collect the funds there were no dissenting voices and Mike does not miss a trick. 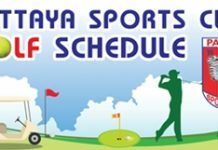 Small fines are imposed at the end of the day for all manner of indiscretions, being late, losing a ball in the water, too many shots on a hole, forgetting your shoes and many other others. With the demands that are made, Mike has emerged unscathed – well so far. The Café Kronborg crew represent the generous golfers at the opening event. 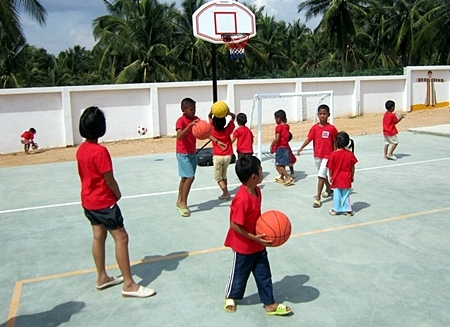 Last year Cafe Kronborg collected sufficient funds to install a filtration system in a school of more than 1,000 children and now they have come to the aid of the Mercy Pattaya by providing portable basketball posts, 2 football posts and nets and some balls for the various sports to use on the multi-purpose sports surface provided by Pattaya Sports Club. 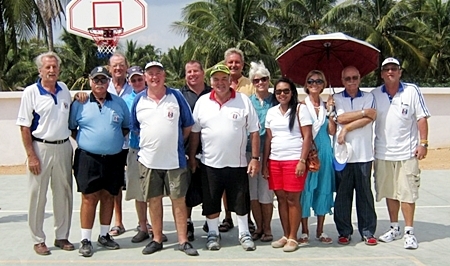 Approximately 10 of the players from cafe Kronborg attended the opening event including Mike Gosden, Dave ‘The Admiral’ Richardson, Peter Blackburn, Paul Cardwell and his wife, Napawan Nuanta who has recently had a bouncing baby boy named Alex and others. Carry on the good work lads and let me know when the pot is full again! The children at the center make good use of the new sporting equipment.